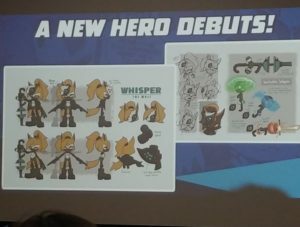 IDW has revealed the design for their latest original character, Whisper the Wolf, debuting in the comic’s eighth next month. The image below was captured by Steve Streza. Whisper’s name and Metal Gear-esque look made me think of Quiet from Metal Gear Solid V: The Phantom Pain. I do like the Metal Gear-esque look. Is it for a twist to reveal later? Is she blind? Is it just another Brock situation? Nevermind, the other image shows that it’s just a mask… that she’s wearing under another mask… ok.
Or is it…? It’s really hard to tell, I can’t get a good look at the other sheet.